On August 20, 79 AD, a series of small tremors and earthquakes began to shake the two ancient Roman cities of Pompeii and Herculaneum. Lying in the shadow of Mount Vesuvius – about 150 miles south of the Roman capital – the two cities were often hit by tremors and earthquakes, so most residents were unperturbed. After all, the tremors were relatively mild, especially compared to a severe earthquake that had hit both towns 17 years earlier. They did not know, however, that this new string of tremors was in fact due to increasing pressure inside Mount Vesuvius; they did not know that Mount Vesuvius was in fact an active volcano; and they did not know that it was about to erupt. Just four days later, on August 24, Vesuvius did just that. 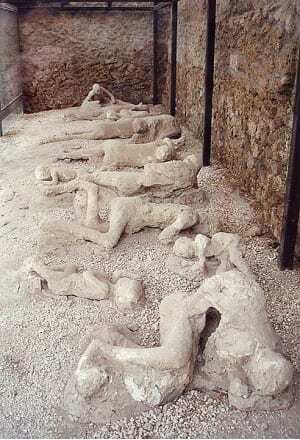 The cities of Pompeii and Herculaneum were taken completely off guard. So much so, in fact, that many residents were unable to escape the rain of pumice and ash that fell to dozens of meters high, burying people inside their homes. Even those who did survive the ash were unable to outrun the pyroclastic flow, a wave of white-hot cinders that tumbled down Mt. Vesuvius at over 100 mph. In just a few days, these cities became buried, and soon were forgotten. Pompeii and Herculaneum remained buried for the next 1,600 years, when military engineers digging a new course for the River Samo uncovered what looked to be an underground city. They had found the remains of the buildings, houses and plazas that made up these two ancient Roman cities. And – perhaps more importantly – they found the remains of the inhabitants, often almost perfectly preserved. This was especially true for the remains of 13 individuals, hidden inside a villa belonging to a Pompeii resident named Caius Iulius Polybius. Inside the villa, two individuals were still holding hands; another was clutching her stomach, the remains of her unborn child still inside. Archaeologists have spent many decades trying to uncover as much as possible about these and the other thousands of individuals found buried in Pompeii and Herculaneum. Now geneticists have entered the fray, using sophisticated techniques to extract and analyze the DNA of these 13 individuals with the goal of understanding the relationships between them. The results of this analysis are published in the July issue of the the Annals of Human Genetics. The research team, led by Giovanni de Bernado from the University of Naples, extracted the mitochondrial DNA (mtDNA) from all 13 individuals. The mtDNA is passed down, almost always unchanged, from a mother to her children. So researchers can conclude that individuals in a grave or archaeological site who share similar or identical mtDNA profiles – known as haplogroups – are likely related to each other along the maternal line. The mtDNA is also useful in archaeology because it is more likely to remain preserved long after an individual dies. But there can be problems with preservation when analyzing mtDNA, and that is exactly what happened with a few of the remains. Di Bernado and his team were unable to extract mtDNA from three of the individuals. But for the others, they were successful. In fact, six of the individuals yielded an identical maternal haplogroup assignment: T2b. T2b exists in about 4-5% of modern Italians, making it one of the rarer haplogroups in the region. So for it to exist at such high levels within a single household almost certainly proves some kind of familial relationship between the inhabitants of this house. Who were the individuals bearing the T2b haplogroup? Four children ranging in age from three to 14, a young woman of about 18 years, and a man of about 30 years. Di Bernado argues that the four children were probably siblings (or at least cousins), that the 18 year-old woman could perhaps be an older sister or aunt, and the man is likely to be a maternal uncle. Unfortunately, one of the female remains – who would be an ideal candidate as the childrens’ mother, yielded no reliable mtDNA type. The remaining individuals bore different haplogroups, and may have represented the father or paternal grandparents. There is also the possibility that one of the adult women was a mistress of the head of the household, something not uncommon in ancient Rome. For many years, the identities of the Pompeian and Herculanean victims’ remains, entombed in ash and cinders, have both haunted and intrigued scientists. Now, with efforts such as the ones performed here by Di Bernado and colleagues, we are learning more about who they were in life, and not just about their final moments.